Early Sunday morning we wen´t to Nazca. It was an adventure of a lifetime I never forget, mostly due to that I was so close of throwing up on the plane but also that I discovered that what everyone is talking about is true. There is a lot of lines and you can see them. It is mysterious and cool. Take off was okay. Smaller plane means more bumps and jumps, but I was fine. They asked if everybody where ok and at first I had no clue why. A little later I got to find out why. Everytime we passed an important figure they tipped the plane first to the left and then to the right so everybody could see them. This was why you got sick. The Asian girl in front of Martin actually did throw up, not so funny. I had to fight it, but survived even if I thanked God when I was back on ground. Before the trip I longed for it since I really enjoy the desert. It was so much fun. The lines are part of the UNESCO World Heritage list, and are an icon of pristine wild nature (of which I am at the moment writing an article about, not Nazca, but nature as pristine or not..). Extra funny since one of the pictures show how they managed to built a road right trough the lines, but not posted here, since I might use it for my thesis so I am saving some pics. When it comes to sustainable travel or more environmental friendly travel, this is not it since the lines have to be enjoyed from an airplane. 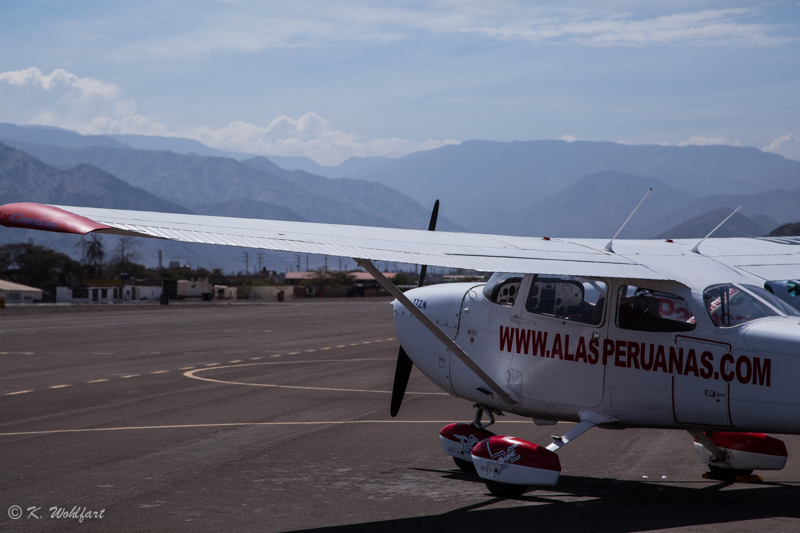 The tour actually takes about 30 minutes in plane, that says a little on how big area it is, and we chose to take the little tour, the one that also covers Pampas de Jumana, takes one hour. You also have to go about 6-7 hours by car from Lima (depending on how many stops) and so forth, so no, this is not the environmentally friendly alternative even if the nature, when you are in the place, is amazing. The tourismsector in Peru, overall is also a bit overexploited, just so you know. Down below you find some of the pics, hope you enjoy them. Will probably post a bunch more in the future, but waiting, as I said, until I am done with my master thesis. This weekend my Canon 5D really got to show what it was made of. And it did really good. Have a lot to do as I am doing my thesis, a film, audioreport and two features at the same time so I am sorry that I don´t have time to read other peoples blogs. Take care, will be back commenting in June. Canon 5D mark iii, 24-105 mm Canon lens, ed. Lightroom. Great earth-shots from the plain! I love these captures! Very cool! I’m THRILLED by that, Katarina ! Now I ’know’ someone who’s actually seen them !!! Are they not the most extraordinary things you’ve ever seen with your own eyes ? I look forward enormously to that time when you’re back home and posting lots of stuff once more. But honestly, I’m really happy for you to have done such an exciting thing !!!! Yes. Well It is great really. But you really get to think about nature, since as I posted, I´m writing an article about reporting on nature and the construction of nature connected to the creation of national parks and tourism right now and it really hits me that everything is so overexploited in so many ways, not just that there is tourist everywhere but that so many of the touristy things is created and that is the western view of tourism that rules, where we, if we don´t like how it looks, just scare off the indigenous people that have been living in an area for so long time, so we can have it for ourselves. Just a reflection, not connected to the lines itself but a reflection.. Yes, it is hard to say if it is bad or if doesn´t really matter at all anymore. But we are tricking ourselves if we think that we are going to see something pristine. Just by being there, it isn´t pristine anymore. Well, DON’T DO IT, then !!!!! haha 🙂 yes, as always one entertaining dialogue with Margarete. Tänka sig att vi vet fortfarande ganska så litet varför dessa monumentala linjerna har kommit till och hur man bara sig åt. haha, jag är flygrädd. Så jag tror att det räckte med flygplan och det är ett gigantiskt område faktiskt. Vet inte om paragliding går att styra så väl.. Men kul förslag! Ibland måste man inse att allt är inte möjligt. Haha jepp. Men det gick bra, fast att jag nästan dog av åksjuka och rädsla men är man bestämd så är man. Will never do it again, men får man chansen så rekommenderar jag det starkt! Spännande o fantastiskt att få se detta i verkligheten. Very interesting! I hadn’t heard of the Nazca lines before and was quite intrigued. The aerial tour must have been fascinating however being nauseous while the plane is rocking back & forth would take some of the joy out of it! haha yes. Well. I am like ”if you throw up you do” but, when you are in the middle of it, it is not fun. There is a reason for feeling as you do, so to say. But yes, looking back at it it was worth it. The Nasca line are a mystery, discovered by a German girl (I think) a long time ago. The man you see in the photo is called the astronaut, and there is talk of praying to aliens and to the gods, or having a calendar etc. IT is old. Not sure how old though. Next PostThousands of dolphins stranded and dead in Peru two years ago- remains a mystery?